Today is the day that I stepped up to the proverbial plate and put in writing that I have been gifted with a new energy healing technique to teach others to use and to use with my clients, friends, family and myself. As long as I can remember, and certainly before I was five, I used my hands to try to alleviate pain, break up the “smootz” or energy globs that I felt with my hands- that my hands automatically zoomed in on- when I touched other people. Years before I heard about visualizations, I would tell a person I was “working on” to imagine the tightness in their body that I was helping them to release was a rubber band that was getting slacker by the moment. Ideas to help release tension would just come to me . As a team my friend, colleague or family member and I would work to create space where there had been discomfort. When I learned about working with a person’s energy field to alleviate discomfort I practiced everyday with the other teachers who taught elementary school with me. Someone would have cramps, or a headache, or a tooth ache and I would give less than two minutes of concentrated “zapping”. I became a clinical social worker so that I’d have a platform for being the healing agent I always was. I became a Reiki Master so that people would have some familiarity with the kind of energy work I had brought through early on in my life and practiced, practiced, practiced.. I always thought that somewhere along the way something new would come through me. And it finally has. It is not mine, I did not create it but I am certain that I am being guided in developing the use of this energy for the benefit of humanity and the planet at this time. I know that may sound very grand to some, but it is a statement based on the probability that if only one person benefits from the work, because all is fundamentally, spiritually physically connected and one, all will benefit. While in meditation a few years ago I received information that was very simple and explicit about a symbol to use to catalyze wellness and wholeness. Even as a Reiki Master I had had difficulty remembering the visuals of the symbols used in that tradition. The new symbol- as old as eternity- is the symbol of eternity, the infinity sign. It is the way that I am using it that is new along with the particular healing traditions that have been incorporated into my being a healing agent that makes it unique. Infinity Healing will be taught to others in the way that both Reconnective Healing® and Reiki healing are. This is through direct exposure, saturation with the energies and receiving information. Because Infinity Healing utilizes muscle checking (applied kinesiology) to determine the course of each session, students of Infinity Healing will be taught muscle checking. This is the first time I am writing about this and I am continuing to develop Infinity Healing as I am guided to do. Today I ordered new business cards. The front of the card has not changed. It is what is pictured above this text. What is new is the back. This is what my new card contains. I welcome and would be grateful for any and all feedback to help grow this new work! It is Time.. Yay!!! This entry was posted in Infinity Healing and tagged 2012, Energy Healing, Infinity Healing. Bookmark the permalink. I’m so thrilled to hear your news. This is wonderful. I know that everyone who seeks training with you in Infinity Healing will find a wonderful benefit from it. Thank you Dear Joie for your loving support! I am so grateful for you wonderful reply. Thank you for all of your kind thoughts. 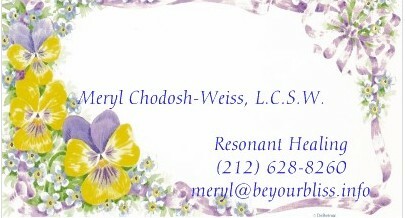 I am an energy practitioner like yourself and we it appears that we have reconnection & reiki in common with each other. Often I use my hands to give healing to my children while they are sleeping. Last week as I was healing my baby daughter, instead of seeing the usual colored rays I saw the infinity sign emanate out of my hands in a cosmic bluish white shade. I felt it’s something ancient thats reappearing. When I researched I found this article by you. What are your thoughts on this? Happy New Year to you and your loved ones as well! That being said, I am excited that you also have received the gift of using the infinity symbol for healing. Your description of it appearing as a cosmic bluish-white light in the form of the infinity symbol exactly matches my earliest impressions of it that I received a few years ago.. I do not perceive phenomenon visually as you do. Rather I perceive more kinesthetically and I have a “sense” of visuals. Therefore I am excited to learn of your experience. Thank you so much for sharing it with me. Although I received the information/instruction to use the infinity symbol, and only this symbol during energetic healings, a while ago, in the beginning of this past July I received new instructions on how to use it. I have described some of this in the articles already posted. After having participated in close to forty Infinity Healing sessions I concur with you that using the symbol for healing is ancient, timeless ( it is infinite, after all) and now reappearing. I don’t know if you are familiar with Magnified Healing, or the channeled work of Saint Germaine/Metatron, but at least since the 1930’s healing agents have been using the tool of the Violet Flame for assisting healing and transmutation. In the year 2012 this tool was re-energized to become a tool to assist humanity to download into our systems the new, intensified energies that are showering our planet. Similarly, although the energy of the Infinity symbol is ancient I believe that it has just recently been re-charged in accordance with the changes in the energy on our planet. I also believe that its potency as a healing tool is now intensifed. I invite you to continue our discussion and ask your permission to publish your message and my reply as a post next week. Thank you for your response & my apologies for the late reply. Yes I am aware of the violet flame, and was introduced to it when I did my Flower of Life training in Glastonbury about five years ago. I used it for a bit but found the Merkaba energy to be more in tune with my energy. I also enjoyed communication with the Hathors & often visited them. Since my last mail to you the power & presence of the infinity symbol has grown in my meditations & I see it all the time in my daily mediations (whilst teaching pranayama & yoga) & universal healing prayers & also with open eyes through my third eye. I am currently studying to become an Ayurvedic physician & I used to be surrounded by an aura of sanskrit letters that has been replaced by greenish white glowing infinity symbols. Now I am guided to just think of a person or situation & the infinity symbol surrounds it & it is done. How do you apply this healing modality? Thanks for your reply. I too am familiar with all of the energy work you mentioned- the Flower of Life, Merkaba work and the transmissions from the Hathors but I am not attracted to work consistently with any of these frequencies. It is very exciting that the power and presence of the infinity symbol has intensified for you and that you are aware of its specific characteristics in your aura. Your instant “zapping” (my language) of persons and situations with the symbol is equally exciting. Although I also sometimes find myself “zapping” situations and people with the symbol as a form of healing transmission or prayer, my use of the symbol seems to be a bit more active. What I mean is simply that there has always been movement and flow along the outline of the symbol rather than a vibrating, more static appearance of the symbol. I also find that the intensity of the energy that is transmitted while using the symbol is stronger and stronger over time. I will be trying to use the symbol in the manner you describe and to see what happens through me. Hi! During a biomat session I was meditating and sending healing to those who needed it. I have 2 friends who are having acl surgery. During my meditation I saw someone wrapping someone else’s knees (both knees) with cloth and she was going in and out of the knees wrapping them together in a sideways figure 8! I thought hmm no one is having both knees done. Today in work, the one man tells me his son is going for a bone scan as he is having problems with his legs. After strenuous sports he is limping. He doesn’t complain just limps. When I was in meditation I thought those legs looked skinny. Now I am wondering if it was my friend’s son I was seeing?? Either way, it must be a good sign for one of them correct? Trust in your instincts and your positive insights received in meditation.